The Geochron World Time Indicator demonstrates-beyond a shadow of a doubt-precisely where the sun is rising and setting every minute of the day. The Geochron is a clock of the world: Its face is a Mercator projection map illuminated to simulate the sun's light as it is cast on the planet. The map (actually three identical maps attached end to end) scrolls left to right at a speed of one inch per hour; the cycle takes 24 hours, the same as the Earth's. At a glance, the Geochron displays which parts of the world are in daylight and which are in darkness. Closer examination will reveal the sun's exact position: A black dot near the center of the map indicates the point of the earth at which the noontime sun appears directly overhead. Because the hours of sunlight change as the Earth progresses through its seasons, the light pattern on the Geochron changes also-almost imperceptibly from day to day. The time of day-or night-around the world is indicated on the time scale. International time-zone boundary lines are drawn on all of the maps. As the maps move, the time-zone arrows indicate the hour. (An alternate row of numbers show daylight-saving time.) Calibrations are at five-minute intervals; more exacting calculations can be made on an optional minute dial . To complete the big picture, the 3 by 2 foot timepiece indicates the day of the week and month at any point on the globe. Manual controls also allow you to display the times of sunrise and sunset. Ironically, in a world of high technology, computer bytes and digital chips, the Geochron is a basic operation: The clock is strictly analog and electromechanical. It is driven by motors, gears and sliding panels in direct simulation of the Earth's rotation in its revolutions around the sun. A host of international luminaries count Geochrons among their possessions. Ronald Reagan bought one when he was governor of California; several now hang in the White House. Thanks to Reagan, one also now hangs in the Kremlin: He gave Mikhail Gorbachev a Geochron at the 1985 Geneva summit. George Shultz, Henry Kissinger and Frank Sinatra each own one. Malcolm Forbes has five-one for each of his three homes, his yacht, and his plane. Ollie North had access to one; so did Frank Carlucci. 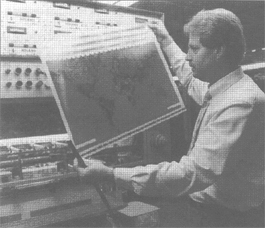 The around the world, nonstop flight of the Voyager aircraft was tracked on a Geochron; the ground crew used the map to chart the plane's course through time zones, and the illumination to monitor day and night travel. Steven Spielberg plots his movie production schedule according to the electric sun. Liberace ordered a custom model-complete with sequins. 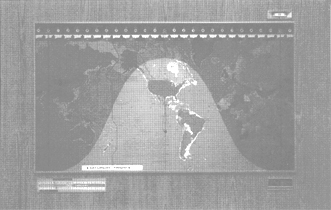 Left: Friday, December 22, 1988, the shortest day of the year in the northern hemisphere, as it appears on the Geochron (40,074 bytes). The inspiration for the Geochron dates to an untimely incident in 1962. During a visit with relatives in Luxembourg, mechanical engineer James Kilburg received a phone call from his wife in California. She had placed the call with assurances from the operator that it was daylight in Europe; actually, it was 2 a.m.
After that abrupt awakening, inventor Kilburg (who had been involved in the development of the automatic telephone dialing system, the car cigarette lighter and a device to remove the pits from maraschino cherries) turned his attention to creating a world time machine. A year later, Kilburg had a working model of a Geochron; two years later, he had a company-and orders for more than 500 clocks. Geochron Enterprises Inc. is currently in the hands of Kilburg's son, James. He and a partner purchased the company shortly before the elder Kilburg died in 1985. Kilburg is bent on perpetuating his father's global concept while conforming to contemporary. Right: Geochron's Kilburg: Word of mouth is the key Past mouths? Gorbachev, Reagan, Bush-and John Lennon. (36,397 bytes). While Norfolk Southern was bargaining with the Feds over its purchase of Conrail, and Transamerica's $660 million merger with Sedgwick Group PLC was making headlines, James Kilburg Jr. signed a contract of his own --- one that kept his father's international business in the family. That was the year, 1985, that Kilburg bought nearly bankrupt Geochron Enterprises Inc. from his father. Today, Kilburg has lifted the company, which manufactures a clock called the Geochron World Time Indicator, to $120,000 profits on $1.2 million sales. Over the same period, Geochron's 21 employees have boosted annual production from 200 to 1,400 units. The clock, developed by Kilburg's father in 1963, displays times, time zones, and the sun's position on any date in any place. And it does so simply. The clock was an almost immediate success. Geochrons hung on walls in the offices or homes of Mikhail Gorbachev, Ronald Reagan, John Wayne, George Bush, John Lennon and Malcolm Forbes. Despite Geochron's popularity, the company was dying. An inventor at heart, Kilburg's father didn't want to face problems with distributors or advertising. And when he became ill in 1983, the company fell behind in production. Revenues slipped. That's when Kilburg, with business partner-now chairman and operations manager Robert Williamson, took over. They moved quickly. Following his father's paper trail, Kilburg compiled a database of past customers, and sent mailers to these worldwide potential buyers. "Past customers buy Geochrons as gifts, tell friends about our new service, and trade in clocks for new ones," says Kilburg. "Word of mouth is still a key component." Kilburg also purchased advertising space in U.S. and international consumer magazines and specialized trade journals. New orders brought new revenue which Geochron turned toward more advertising, a profit sharing program, and the company's first computer system. Geochron's advertising budget is still relatively small just $35,000 but Kilburg hopes for more. When Kilburg bought the company, he also set up a service department, and refurbished the 60 Geochrons that his father who simply shipped new clocks to avoid fixing old ones-left in the factory's storage attic. Kilburg sold the repaired clocks as used Geochrons, and informed longtime Geochron owners of the new service. Now, product repair brings in $160,000 each year. Kilburg also tuned up Geochron's international sales strategy. In the lobbies of international hotels, and New York's JFK Airport, Geochron catches the attention of world traders. Kilburg also contacted dealers whom his father turned away. Today, more than 45 distributors in 22 countries from Saudi Arabia and Singapore to the Netherlands and Nigeria pump 70 percent of sales into the company. Europe alone generates 20% of Geochron's total sales volume. Kilburg hopes Geochron's sales growth will continue upward toward the $5 million mark. Indeed, he plans to reach that point within three years. To Kilburg, "a smaller, more affordable product is the key to reaching that goal." Kilburg already has three prototype designs for desktop-size, digital Geochron in his hands, and says the new clock will be ready by Christmas.